Arava Institute alumni Eve Tendler and Shadi Shiha spent the past month visiting universities and communities throughout the United States promoting peace-building and environmental cooperation, as part of the Friends of the Arava Institute’s Dialogue Project. The alumni shared personal stories from their time spent at the Arava Institute as well as experiences growing up on opposite sides of the Israeli-Palestinian conflict. Both Shadi and Eve studied at the Arava Institute in 2016-2017. Together, along with other international students, they worked towards solving today’s most pressing environmental challenges. During the Dialogue Project, Shadi and Eve visited more than 20 different colleges and universities educating others on the idea that environmental issues in the Middle East transcend borders. The Dialogue Project is a speaking tour that focuses on bridging conflicts through dialogue and interpersonal communication. 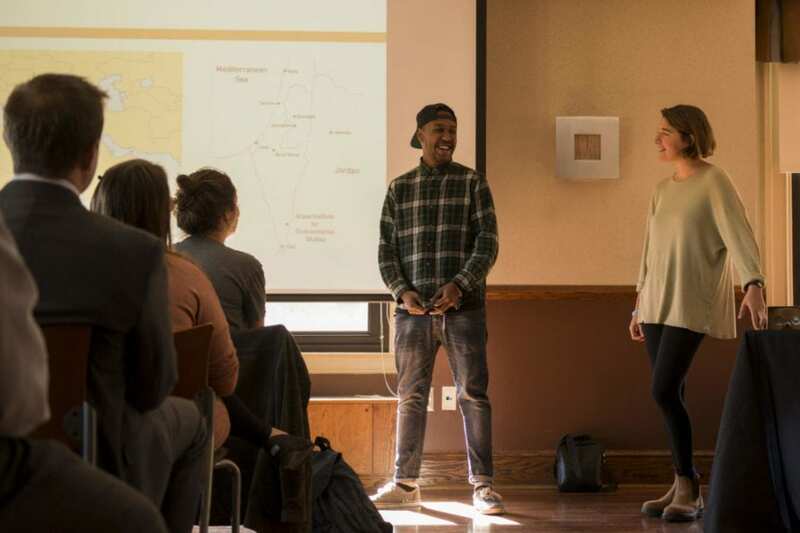 The tour started in Boston and visited campuses across the United States, including Tufts University, the University of Pittsburgh, Michigan State University, and others. Events held on campuses and within local communities helped raise awareness of the Arava Institute and its efforts to help solve environmental challenges through mutual respect and peace-building. The next Dialogue Project tour will take place February 2018. If your campus or community is interested in hosting a Dialogue Project event, please contact Ari Massefski.